"When I wrote that song it was one of the last songs for the record. I like the obviousness of the track but I was fearful of the obviousness of the track and in a record that I think is pretty dense and somewhat challenging to get through, I didn't want a song that was too obviously the hit single. Of all the tracks on that album I think that was the hardest to arrange and mix, because if it was mixed poorly, it sounded too obvious in the context of the record, and at this point we were very aware of the context of the record. So what I learned from the process of doing that was the vocal track I would have thrown out that was out of tune and my voice was breaking up was the one that I needed to use, because it added a desperation that made the whole mood of the song feel right." 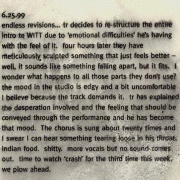 Journal entry from The Fragile sessions in 1999 published on nin.com detailing the overhaul of the intro of "We're in This Together." Journal entry from The Fragile sessions in 1999 published on nin.com detailing more work on "We're in This Together." Screenshot of ProTools session from "We're In This Together" published on nin.com during The Fragile era. This is the original album version, found on The Fragile, yellow and green discs of We're In This Together and Australian Into The Void. Beginning out of the ending of "The Wretched" with a machine-like, rhythmic sound collage, it builds in volume and intensity but stops to introduce the main rhythmic thrust of the song, a distorted and staccato guitar riff that runs through all of the verses. After the drums and wah guitar enter, Reznor begins yelling the first verse abrasively. The chorus is driven by loud, distorted and constant guitars and live drums accompanying more melodic and higher-pitched yelling by Reznor. After a second verse and chorus, a driving bridge featuring a wah guitar solo and walls of fluent guitars leads into a final chorus. A descending guitar riff from this chorus continues through the mellow coda of the song, a section which also shares the three-note motif used in "The Great Below" and the piano motif of "La Mer." It eventually gives way to the opening e-bow guitar line of "The Fragile." On the vinyl version, the segue from "The Wretched" (in the beginning) is removed; on the singles, the song is completely cropped from segues at the beginning and ending. 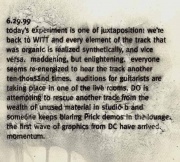 An alternate version of the introduction was indexed separately and titled "Missing Places" on The Fragile: Deviations 1. Released exclusively through Apple Music, this instrumental version also has an extended ending. Released exclusively on The Fragile: Deviations 1, this version does not contain its original intro and is instead placed after an alternate intro entitled "Missing Places". In this edit, the intro is shortened and the coda is significantly shortened; it was released on part 2 of its single. This is found only on the promo, and begins with an instrumental chorus before going to the first verse. The coda is shortened even more than the other radio edit. The full length version of the music video for the song extends its introduction, making the song run approximately 7:52. Various new layers of ambient sounds and drones begin the song, extending the repeated rhythmic guitar motif before the drums kick in. It also features a female voice whispering "even after everything" and "nothing else" during the initial noise loop pattern. The music video for this song first aired in 1999, and was directed by Mark Pellington. It shows Trent Reznor and an army of black-clad people running frantically through empty buildings, streets, and eventually a desolate field where everyone except Reznor had disappeared. The video was filmed on location in Guadalajara, Mexico. Two different edits of the video were made: the version released to video outlets, and an extended version edited by Mark Pellington. The extended version, clocking in at nearly 8 minutes, also features an extended intro unique to the video. "When I came to do the video for it I tried to make the song uglier than it would have been if you just heard it and the idea of a tragedy or situation where everything is happening too fast, you're not aware of where you're at until it's too late and you might be caught up in something you're not sure about but you're blindly embracing this comfort of security, that was the global idea for that." "There was good artistic communication until the very end when I got the edit back and got into a situation where what I saw in my head wasn't on the screen. It comes down to a bigger problem which is I've taken over every aspect of the recording process... But in the world of video, I don't know how to do that yet, I haven't directed my own videos so I have to embrace another artists ideals and hope that they see my vision. On this particular one when I got to the end I realized his vision wasn't mine and we tried to reach a common ground and heads butted, and it amounted to me editing the video by myself. There's a slightly unpleasant taste in the whole process of that thing but it made me learn it's time to read the manual for my video camera and just do that too." Although "We're In This Together" is a single, it was not performed live until the Performance 2007 tour. This song is performed in a lower key, presumably due to the vocal strain required to sing it as it appears in the album. The song debuted at Lisbon, Portugal, and was played at (at least) three other shows. Previous track - "The Wretched" Track 5 from The Fragile Left (CD), Side B (Vinyl) Next track - "The Fragile"
This page was last modified on 1 July 2018, at 16:51. This page has been accessed 144,711 times.